The Kirribilli Markets were first held on January 21st 1976 in the back yard of the then newly opened Kirribilli Neighbourhood Centre. The Market quickly grew in size and popularity spreading into the adjacent yard of the then Milsons Point Public School. When Milson's Point Public School was sold the Markets moved to the park along Alfred Street South beside the Bridge and then for a short time to Bradfield Park under the Bridge. When North Sydney Council acquired the Anzac Memorial Bowling Club the Council kindly gave permission to the Markets to conducted on the old bowling green and in the Burton street tunnel. This allowed the Markets to expand to it's present 220 stalls. All monies raised by the Market go to fund the programs of the Kirribilli Centre. 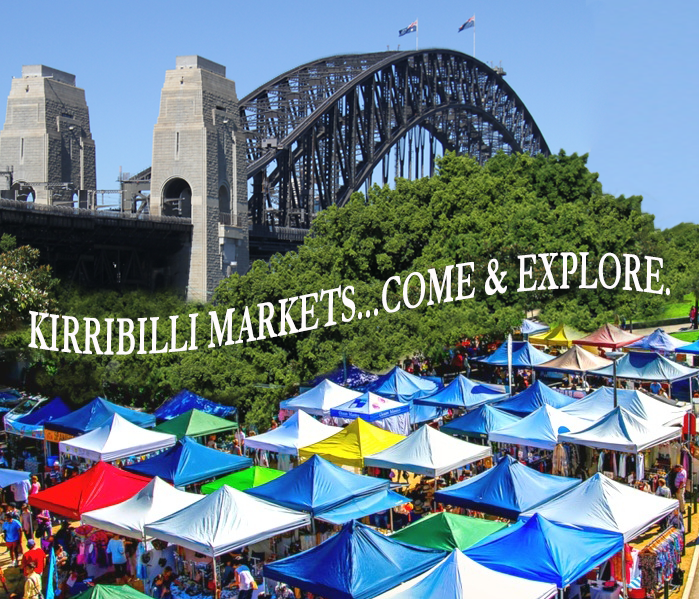 Today, The Kirribilli Markets is now one of Sydney's oldest and most popular Markets. Featuring over 220 stalls selling, New and recycled fashion and accessories, Emerging local Fashion Designers, Home and Gift wares, Arts and Craft, Jewellery, Plants, Gourmet foods and a whole lot more! There are two Markets held each Month: The Art, Design & Fashion Market, held on the second Sunday of the month, is a boutique Market with Artisan made goods in the Tunnel and Fashion, food and more on the Green and Gravel areas. The General Market, held on the fourth Saturday of the month has everything you could want from Artisan goods to secondhand clothes and more. Both Markets have two eating areas, Eat Street which is on Burton street and Gourmet Corner which is located on the Gravel area of the market. As well as live entertainment all day long in Burton Street. In 2014 The Kirribilli Markets partnered with The Smith Family to provides charity clothes bins at each Market for the disposal of unsold secondhand clothing. Well over 10,000kg of clothing has been collected through these bins, which has greatly reduced the amount of waste the Markets sends to landfill and benefits a great charity. The bins are located at each Market near the markets management tent.